It’s Lois Duncan month! Why? Because I can! Actually, this month the latest adaption of one of Duncan’s novels is released later this August. Look it, everyone. I’m being topical! I love Duncan’s work. She has a fantastic ability to make teenagers suffer. They’re both realistic and surreal, often blending the two seamlessly. Many adaptions of her novels, though, are rather strange. In a Buzzfeed article from two years before her death, Duncan was supposedly astonished while watching the theatrical version of I Know What You Did Last Summer. In 1989, Duncan’s daughter Kaitlyn was murdered. The distress she put her own characters through no longer seemed appealing. Seeing added violence to her work was probably all the more appalling. I’ve Been Waiting For You is an adaptation of Duncan’s final (fictional) thriller. Sarah and her mother move to the sleepy town of Pinecrest, Massachusetts from California. Sarah has natural abilities to see into the future. On her first day of class, she frightens her classmate by correctly reading his palm. But she finds a kindred spirit in Charlie, the young boy who works at the local crystal shop in town. It’s through Charlie that Sarah begins to learn the mythology behind her new house, the Lancaster House. 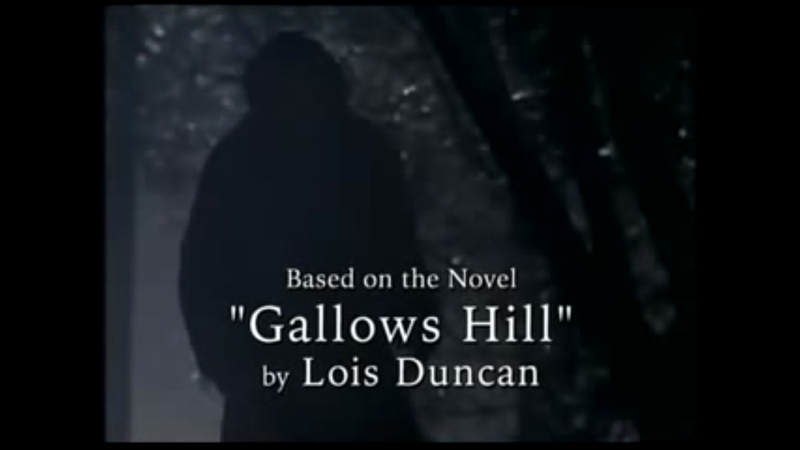 He tells her that a woman had once lived in the town, and was burned for being a witch in a place near to her home. Before dying, the witch had vowed to take revenge on the descendants of those that had burned her. The kids making hell of Sarah’s social life are clearly the descendants in question. They call themselves the Descendants Club. With Sarah’s arrival, they all become nervous. Her natural ‘witchy’ abilities frighten them. The Descendants tell Sarah more about the witch’s story. She was named Sarah Lancaster. She was taken to jail, and while imprisoned she learned that her lover had married another woman. One night, the couple were murdered. As Sarah had been locked up, she couldn’t possibly be the witch…only she was found in her cell – covered in blood. Despite the fact that the group terrorise her (and tell her stories that she’s descendant of a witch), she agrees to go to one of their parties. But couple Kyra and Eric want her to be a fortune teller. They hook her up to a wire so she can be fed information about the people whose fortunes she’s reading. Unbeknownst to her, Kyra and Eric leave after they get bored. Sarah believes she’s hearing their voices tell her what to say, but she’s clearly hearing true fortunes. One of her predictions is a little too close to home, and one of the girls runs away from the party. The girl is found the next day, seemingly scared to death. But her death only causes the students in Pincrest to suspect Sarah of more horrible business. She becomes the target of increasingly horrible attacks, including one that almost drowns her. But while Sarah survives, members of the Descendants Club being to dwindle. The suspense builds and the secrets keep getting revealed and ultimately explodes in a pretty fun twist ending. The heart of the film is really interesting and compelling to watch. Is Sarah really a witch? Or is she merely innocent and targeted because of her powers? The addition of a masked serial killer, though… feels unnecessary. It’s pretty clear in this adaption that the filmmakers were trying to bank on I Know What…’s success. Throw in a serial killer and lots of death scenes. Grim, yes. But that’s what successful franchises are built on. As a made-for-TV movie, I’ve Been Waiting For You is pretty low on violence. But it still begs the question: what did the violence add, if anything, to the film? Are viewers so hungry for murder that we can’t handle a simple thriller? Or is it simply the case of an author’s name being tied to an idea of violence that doesn’t really belong to her. But as far as adaptions of Duncan’s books go. This is one of the most enjoyable ones I’ve seen. The script is a bit corny, but it still perfectly encapsulates autumnal spookiness. For a bit of witchy fun, make sure to watch this one.